BELIEVE OR NOT WE TEND TO RUN ON TIME! Helps us to keep the flow of patients running smoothly throughout the day by being on time. Early, or late arrivals may need to wait a few minutes before being seen. New Patients are asked to arrive at least 15 minutes before their 1st appointment, to complete paperwork. If you would rather fill them out ahead of time, you can print our new patient forms from our website and bring them with you. If you are running late, please call to let us know. 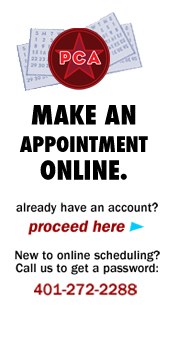 We can usually fit you in later in the day, but if we can’t we may need to charge you a Missed Appointment Fee. OTHER THINGS TO KNOW ABOUT YOUR APPOINTMENT. We treat in a peaceful group setting. Patients sit in reclining chairs in one of our two large treatment rooms. Many people fall asleep while they’re here (we call this an “acu-nap”). Others will rest or feel sleepy during the treatment. Wear loose, comfortable clothing that allows you to push clothing comfortably above the knees and elbows, there is no need to disrobe. We rely mostly on acupuncture points in your lower arms and lower legs and use these points to treat all parts of the body. Perfume, cologne, or any strongly scented lotions or products, can cause allergies or migraines for others. Please wait until after your appointment to use these. Because we treat in a group setting, please bring earplugs or headphones if you are sensitive to the routine noises of people getting settled and treated in this space. Speak softly, minimize other noise, and turn off cell phones and pagers while in the treatment rooms. If you wish to listen to your own music, you may do so with headphones, and at low volume so as not to disturb other patients. Do I need to bring my own linens? Please don’t. We provide a safe and clean treatment setting by carefully choosing and monitoring all of our linens which are cleaned regularly. Stay as long as you like for treatment. * Most people stay 45 minutes to an hour. If you happen to fall asleep (we call this an acu-nap), you can wake up on your own. Or, you can let us know when you need to leave, and we will get you up at that time. *Please note that the clinic closes 1 hour after the last appointment of the day. Visitors are not permitted in the treatment rooms, but are welcome to wait in our reception area. Patients that need assistance getting in and out of the treatment room may have a friend, family member, or caregiver help them. Sorry, as much as we love them, we can’t have pets at the clinic. Of course, service animals are welcome.